After a mini revival it’s back to league action this Wednesday night as FC take on promotion hopefuls Buxton at Gigg Lane, kick off 7.45. Two excellent wins in the last week have raised morale in the dressing room but Buxton will be no pushovers as they already sit comfortably in a promotion play off position and have the confidence of knowing they did the double over FC last season. 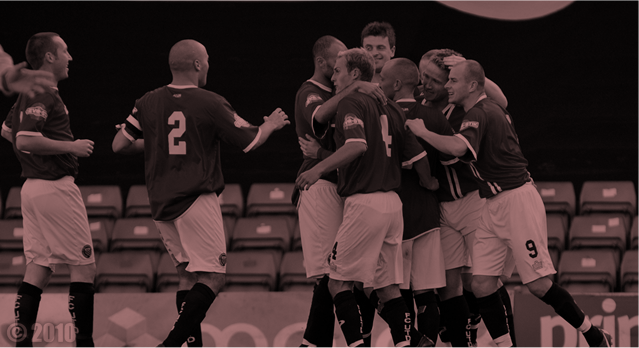 Get yourself to that football ground – FC United V Buxton, Gigg Lane, Wednesday 29th September, kick off 7.45 pm. The FA Cup 3rd Qualifying round draw has thrown up a fascinating tie for FC away at Northern League Division 1 side Norton and Stockton Ancients a week on Saturday, 9th October. Although the Northern League is in theory equivalent to North West Counties level it is widely accepted that the standard of football is much higher as teams and players from this part of the world tend not to join the higher leagues due to costs of travelling. Whitley Bay who are in the same division as Ancients are the reigning FA Vase holders and had an excellent 3-2 win at Nantwich in the last round. Nothing can be taken for granted. The ground is part of a larger sports complex which includes cricket and football pitches and only a short drive from Middlesbrough. There is a small seated stand and a smaller covered standing area. The remainder of the ground is a path behind a railing around the pitch. Full details have yet to be confirmed but it has the makings of a good day out bringing back memories of our very first national cup tie at Brodsworth Miners Welfare in 2006. It’s still warm enough for an ice cream isn’t it? FC Minithon 2010 – sign up today – the players have! There’s still time to enter FC’s annual charity run, the FC Minithon which takes place on Sunday 17th October 2010. Set over 5.8 kilometres around scenic Chorlton Meadows, the event will see FC United supporters, members and friends running, walking and in some cases crawling(!) to raise money for children’s charity the Frost Foundation, FC United and fellow supporter-owned clubs, Rochdale Hornets and Mancunians RL. All you have to do to take part is pledge to raise at least £25.00 sponsorship money and pay the £10.00 registration fee for adults. There is no minimum sponsorship for under 18s, just a £5 registration fee. All those who can pledge to raise £50 however, are eligible for prizes. Categories include Fastest male, Fastest female, Fastest player, Fastest female junior, Fastest male junior, Best headgear, Best dressed runner, First dog and owner and Best dressed branch. For the first time this year certificates will be presented to Junior entrants and for families who want to enjoy a genteel walk there will be two local guides giving a talk about the local area on the way around the course. entertainment and refreshments will be provided. Entry is easy at www.fc-utd.co.uk/minithon2010 The closing date is Friday 8th October 2010, so don’t delay, sign up today! And you’ll be in good company too because Margy has signed up and so have most of the players. It’s also rumoured that general manager Andy Walsh will be defying his advancing years and turning out too despite nearly suffering a heart attack last year!